It will take years in the pace I've been working on this set the last week! So you will have enough time I'm sure. As I said before I love them! 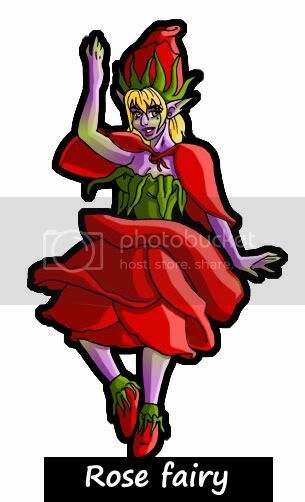 ;D My fav one is red grape fairy, the yellow poppy flower fairy and the red poppy fairy! It looks really awesome! 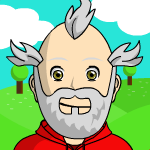 The auld grump: I cannot see its face, it makes a good mummy, the person did a very good job making it look real. Here's a picture of the poor thing's little face. The artist did a very good job. The Auld Grump, your fairies are much more lively. Thanks for the link. I like those statues on there. Mightn't the red Grape Faerie also be a Raisin Faerie? Very appropriate! Thanks for the comment Docryder. I'm at work now, but I'll show these to my resident fairy critic in the morning and see what she thinks. 'tell me when they're finished and we'll print them out' were her parting words as she went off to play with her train set that has currently taken over the living room!!!! My favourirtes are the poppy fairies!! 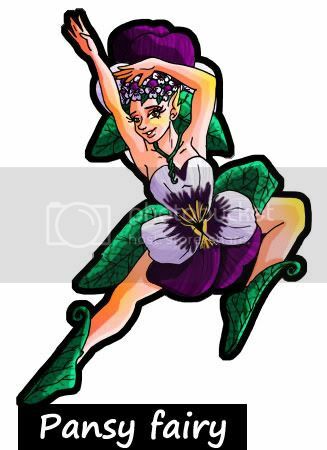 I like the Pansy and the Poppy fairies because they're dancers. 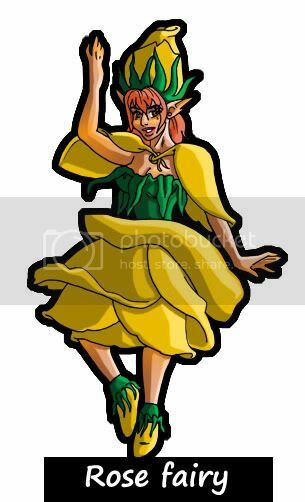 Thank you Anita for the dancer fairies. Okay that's all I want to say. Sounds like the poppy fairies are popular! Jabbro doesn't like the poppy fairies too much. These girls are so cute! Thanks Magpiestear and Squirmydad for commenting! I am working on it for so long now, that I consider this my first pay-set. Just so you guys know what to expect. The coloring looks fantastic! I like to color blends, very elfish. These are really great! I like them. 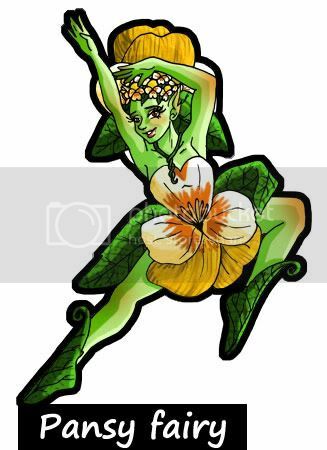 Especially the pansy and the apple fairies. Really awesome job. And wonderful colorings. Wow very evocative and complementary color palette selections. Thanks Jim! I was hoping it would rather look fairyish but elfish is good too. I'm glad you like my coloring. Xtea: I thought you like the purple Dracena the best or my memory is escaping me? Floyd: Yes, I'm working on them. I need a lot of these designs because I plan to shrink them down and put like 3 of them on one "model". Color wheel helps to choose these colors, without it I would probably do something totally different --like use only blues, or use only ones that have the tint of yellow. Well, you get the point. I'm no Van Gogh. I kept them away from you guys because I don't like to see myself double posting so I was planning to show a lot of them to you, but only a few for now. 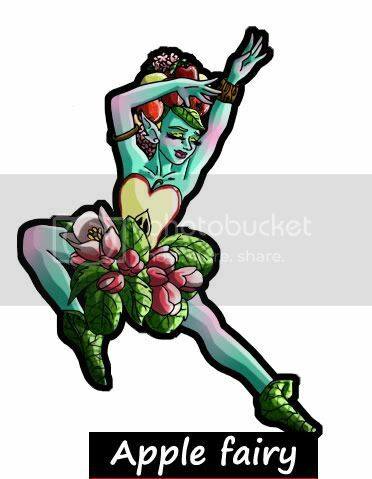 I found another example of insectile faerie, warning - naked faerie art nouveau clipart. Nothing overtly rude, just undraped. The Auld Grump thanks for the pictures. If I get to the insect people I'm going to do it the way I started to design them. The full body is going to look like that the humanoid genes are mixed with insects, not just the legs and the back. Well, it was an alternative - you did not sound all that happy with the straight up humanoid/insect look. If my centauroid ramblings have done nothing but make you happier with your original choice then all to the good. I am not happy with my designs still, they need some tweaking. The only reason that I do not concentrate on the bug creatures because I don't find them fairy like. 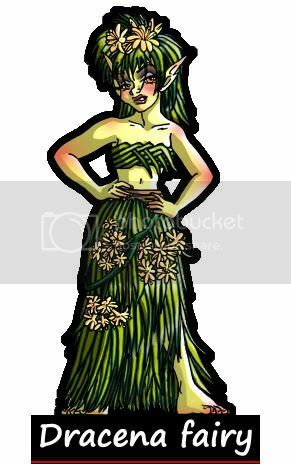 As for the dracena fairy... I'm surprised that is the one that pulled the image of Carmen Miranda into your mind, I mean the apple fairy has a well packed hat on her head --a lot closer to the ones Carmen was wearing. That is interesting though, I wonder why the dracena had this effect on you. I have gotten involved playing Dragon Age Origins, which means that I'm taking a break from drawing. I am not sure when are they going to hit the market. My apologies -the game is way too interesting. Bummer. I too was watching this faerie project with great interest. That's easy - the skirt. 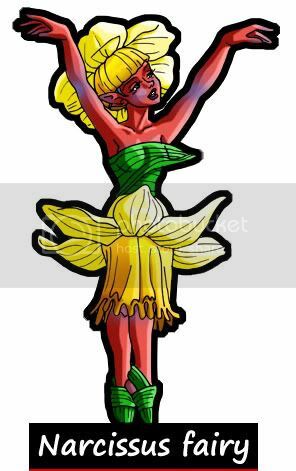 For me Carmen Miranda is always associated with both the involved head gear (not always a fruit basket) and long skirts. Boom chicka chic! I'm sorry if I am messing up someone's schedules. I was giving you guys heads up so things like that won't happen. I wasn't sure anybody is really that interested in this set aside from 3 cute daughters And people who want insect-like fairies. I really cannot help myself, I play into the night not even realizing that it is over bedtime I'm so involved with this game! And that says something. Whohoo! Game playing distracting you from creating? I had the same problem a couple of weeks ago with this game I found called "HALO", maybe you've heard of it? I work on a Mac and there aren't many games for it that interest me, so I get more work done. Recently I upgraded my Paralells program (which allows me to run Windows on my Mac) and found that the HALO universe is now playable on my Mac....is it December already? One useful thing about video games (good ones) is that I get to see some good examples of texturing and model detailing techniques that I fully intend to incorporate into my own model and texture work...just as soon as I defeat the Covenant troops on the ship. Have fun doing what your doing. This is a hobby after all. I know for my part, if I ever got back into video gaming, you would never see me here again. I have also been busing myself with painting and other craft projects. The fairies will awesome when their finished! Jim: Thanks for the trust. I think we all should keep it fun or you'll burn out. Eric: Who haven't heard about Halo... I haven't played it though, I'm not that interested in war games... just fantasy ;D But yeah everyone say it is really good. Anita, your fairies are delightful and extraordinary. They look great at this size, and I'm sure they'll look amazing at tabletop scales. Those mummified fairies are super cool. 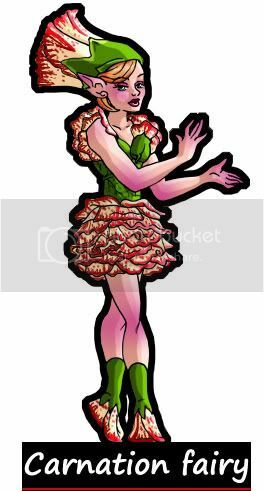 If you really want to make fairies seem real, produce a corpse, ha! Sorry about the brevity above - my laptop gave me a six minute shutdown warning as I opened it. Thinking about it, I can see where Caitlin is coming from - mice would be rather nice, and if the fairies shown so far end up being about 1 inch or so in height then the mice can be done near life size. I can also see such things as riding pigeons, but then I am a Pratchett fan. (Feegle wa hai!) Chipmunks might also be cute. 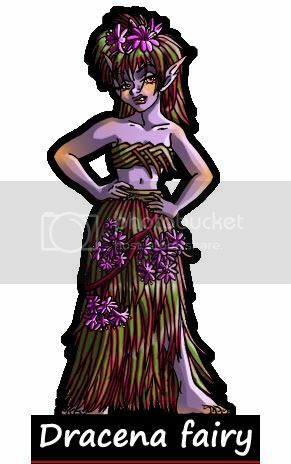 I can think of some less pleasant flower fairies to add to the mix - Nightshade(or Belladonna - really common around where I live), Monkshood (or Wolfsbane, or Devil's Helmet), Bloodroot, Jack-In-the-Pulpit, Foxglove, Lily of the Valley, Yew, and Hemlock. 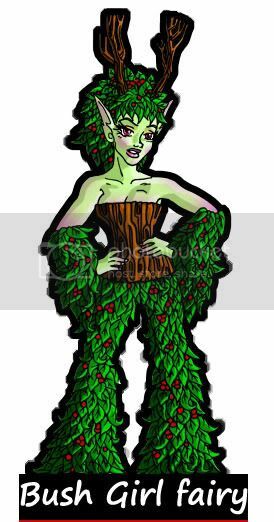 Given the season, perhaps Mistletoe, Ash, and Holly for the nicer fey. 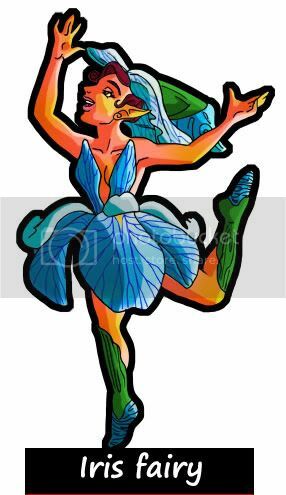 Mushroom fey might include Puffball and Amanita (ever notice that the Smurfs live in poisonous mushrooms? ). Dave: Thanks for the comment! I am not going to start playing Halo then if it is really that overrated. It must be good for some who likes the genre though because of how many parts have been made. 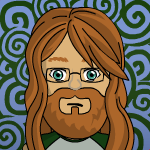 The Auld Grump: Thank you for forwarding the messages. As for the moment there were no plans for rider fairies. Later on I might change my mind and make a whole army of them if I ever get back to drawing. This game is just way too cool. Oh, and Xmas is coming up so there are other reasons to be extra busy.